Situated on Tenerife’s southern coast is the sophisticated resort of Los Cristianos, once a traditional sleepy Spanish fishing village, the resort has now been transformed into a popular holiday hotspot. The resort has a scenic harbour area where many an excursion takes place ranging from glass bottom boat trips and diving experiences to fishing trips and island hoping to the popular La Gomera island for the day. 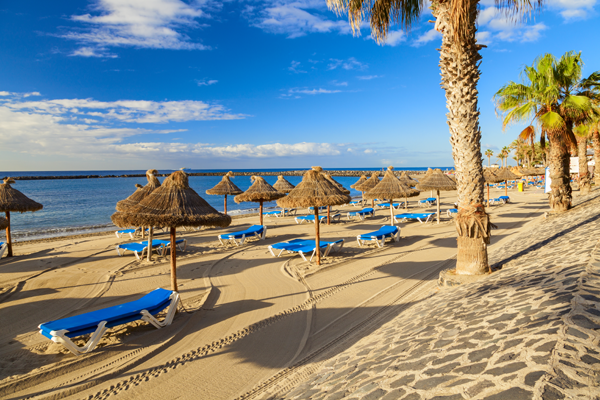 Los Cristianos is a fantastic choice for a relaxing holiday in Tenerife. The resort still offers a real traditional Spanish charm that attracts many holidaymakers back year after year. The promenade runs right the way along the seafront and links to the nearby resorts of Playa de las Americas and Costa Adeje. With great beaches, plenty of shops and a good choice of places to eat and drink whilst enjoying the lovely views, it is easy to see why so many locals enjoy the resort as much as tourists. Holidays to Los Cristianos are particularly popular with couples and families who love the traffic free centre. The resort offers everything you would expect in terms of as lively bars, friendly restaurants and a wide choice of places to stay, and there is something for all tastes and budgets. The pavement bars and restaurants on the seafront are an ideal spot to enjoy a cool drink whilst watching the sunset. Couples can enjoy a pleasent evening stroll around the harbour before a nice meal at one of the many seafood restaurants serving the fresh catch of the day. Los Cristianos holidays are often spent on one of the three sandy beaches that gently shelve in the warm waters and perfect for a relaxing day. The long hot summer days see lovely temperaturesthat can reach 30ºc between May and October or enjoy a winter holiday in Los Cristianos for a perfect getaway from the cold UK, as the temperatures still remain around 20ºc. Los Cristianos holidays offer something for everyone, perfect for couples, singles, families or groups looking to stay in a budget self catering apartment, a glamorous five star hotel or Villa, this resort has it all, don’t delay, book with us today!